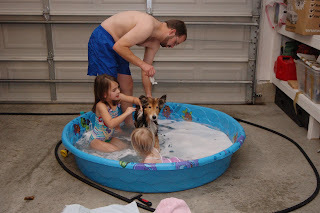 bath your children with the dog. A couple of weeks ago Kevin decided to give Elliott a bath. So he moved the car out of the garage, grabbed the pool and used it as a bath tub. We have our warm water hooked up to our water hose so he had a warm bath. 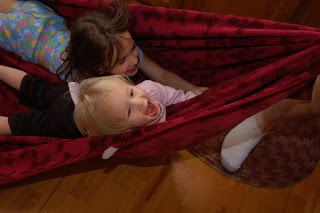 Of course the girls could not resist getting in too. 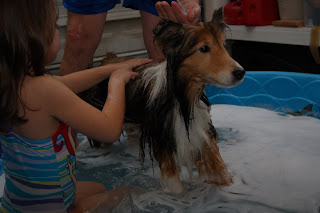 I have a couple more pics of Elliott during his bath but there is not much difference. He did not move the whole time. It was so funny! You would have thought he was being mistreated. This is one of the girls favorite thing to do with Daddy. He pulls them around on the kitchen floor on a blanket. They love it!! Again!! Again!! Again!! and squeals of joy. I love this pic. An action shot. Ya!! They are being mistreated too. Can't you tell? So sorry I have been MIA. Things have been busy since we got back from our Thanksgiving trip. I have been decorating, shopping, homework, playing with the girls, spending time with hubby and making Christmas cards. No, I'm not finished with my cards yet but I hope to get them out sometime this week. So family and friends keep watch they are coming and with pictures. It will be worth the wait. I will try to update tomorrow with some Christmas decor pics. Thanks for checking in and for all the request for a blog update. 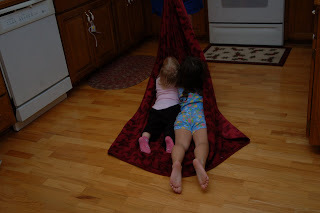 The girls have so much fun being pulled around on a blanket. Cheap fun!! Elliott looks like he had fun…I think daddy and the girls had more fun playing though. Yay! your back! I missed you! Merry Christmas! PS email me your home address...I have a christmas card for you.